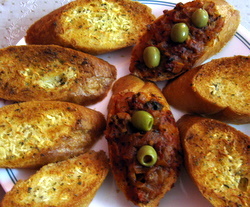 Garlic Bread recipe And Tomato Bread Recipe - An Awesome Appetizer. This garlic bread recipe is so simple and so delicious that your guests will thoroughly enjoy it. To double their pleasure you can make the tomato bread as well. It is a deadly combination. A nice finger food for your guests. Once you have done the basic preparation (which can be done ahead), it is really a matter of spreading and bunging it in the oven. While you chat with your guests, the aroma of garlic will start building the appetite. This appetizer recipe is so yummy that if you have too many of these (which you will), there will be no room left for the main meal.......oops. It will be a good idea to have a light meal on the menu. Mix the garlic, oregano, salt and pepper in the butter (should be at room temperature). Your spread is ready. Refrigerate it until ready to use. Give it sufficient time to become soft, for easy spreading. In a pan heat some olive oil (not too hot,otherwise the garlic will burn/Also you should never heat olive oil over 180°C). Add the garlic, saute for a minute. Add the onions and saute on a low to medium heat, till they soften. Now you can add the tomatoes and puree. Cook till this mixture dries (all the water evaporates). Add the salt, sugar, ketchup and basil. Your tomato spread is ready. Let it cool down to room temperature. Cut the baguette diagonally into 1 inch slices. On half of the slices, spread the garlic butter on both sides. On the remaining, spread some butter on the bottom side and the tomato spread on the top. Place the olives on top of the spread and drizzle with a little olive oil. Arrange the slices on a baking tray. Bake for 10 minutes. Then Place under the grill for 3-4 minutes until brown on the top. Enjoy the flavors of a good appetizer recipe.